What’s better than 4K resolution in a monitor? Four times 4K! Yes, previously only seen in prototypes or in sizes far too large for a desktop, we’re excited to announce our new 8K monitor. As the world’s number one monitor brand for three years running, we are relentless in our commitment to delivering the best visual experiences for our customers. It’s a mantel we don’t take lightly, which is why we’re so excited to deliver the world’s first 32-inch 8K and the world’s overall thinnest monitor, as well as a slew of other exciting products at #ces2017 in Las Vegas. In 2015, we brought you the UltraSharp 34 Curved Monitor with its innovative curved display and the UltraSharp 27 Ultra HD 5K Monitor with its stunning 5K resolution – both CES Innovation Award Honorees. In 2016, we announced our first OLED Monitor and brought the innovative InfinityEdge technology, that debuted in 2015 on XPS 13, to our monitor portfolio. This year, we announced an extensive new lineup of innovative monitors, including the Dell UltraSharp 32 Ultra HD 8K, the Dell 27 Ultrathin Monitor with Dell’s innovative HDR feature, two new innovative P-series monitors and the first consumer monitors to offer Dell’s InfinityEdge display on our updated S family of monitors. 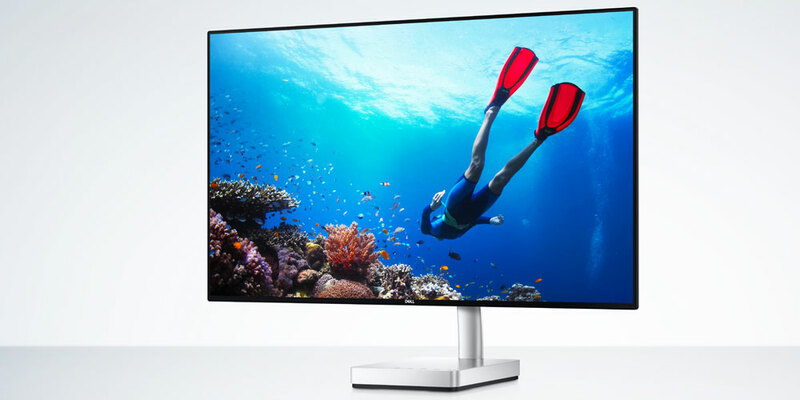 With our new UltraSharp 32 Ultra HD 8K Monitor (UP3218K), we’re pushing the boundaries of innovation to feature four times more content than Ultra HD 4K resolution and 16 times more content than Full HD in addition to 33.2 million pixels of resolution compared to a 5K monitor’s 14 million pixels of resolution. The new UP3218K offers breakthrough realism with the finest details and color-critical performance for a truly transcendent visual experience thanks to Dell PremierColor, which offers 1.07 billion colors and 100 percent Adobe RGB and 100 percent sRGB, and an unprecedented 280 ppi to view most images in native format. Feast your eyes! 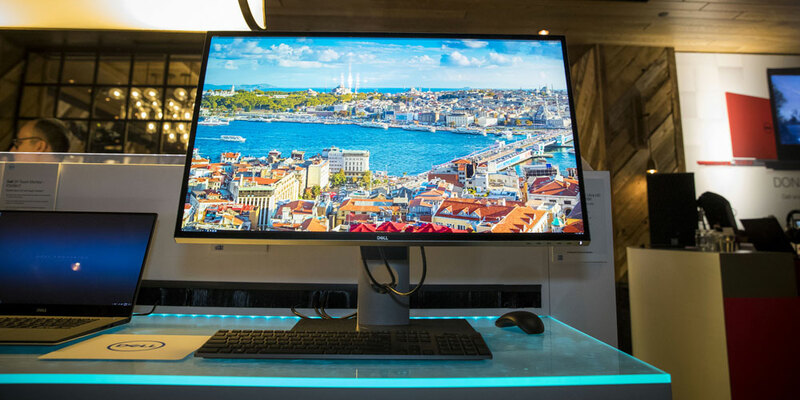 Earning the distinction of CES 2017 Innovation Awards Honoree and featuring the world’s overall thinnest profile, the new Dell 27 Ultrathin Monitor’s striking design is sure to catch the eye. With Quad HD technology and USB Type-C connectivity, the S2718D integrates a sleek, modern design aesthetic to complement any space and offers an expansive entertainment experience without borders, courtesy of Dell’s InfinityEdge display. Position the stunning display however feels best with the articulated hinge and enjoy an unhampered view from nearly any angle. Sophisticated and understated, this state-of-the-art design beautifully and subtly houses the critical components in a slim base, making it perfect for a multitude of lifestyles and contemporary workspaces. Not only is the ultrathin design remarkable but the S2718D also offers Dell’s HDR feature, which allows you to experience the next generation of entertainment with stunning visuals in high dynamic range, enhancing the experience with exceptionally vivid images, higher clarity with visibly vibrant textures and increased contrast. Sporting built-in USB Type-C connectivity for added convenience of all-in-one cable management, ComfortView and a flicker-free screen for eye comfort, the S2718D adds convenience to an already astounding visual experience. We’re also excited to announce two other innovative monitors at CES 2017 – the Dell 24 Touch Monitor (P2418HT) and the Dell 24 Monitor for Video Conferencing (P2418HZ). The Dell 24 Touch Monitor features an anti-glare touch screen that allows for intuitive 10-point touch, compatible with Windows 10, without a distracting reflection or fingerprints. The P2418HT also sports a unique articulating stand that offers height adjustment, as well as extended tilt and swivel capabilities so you can position it however you like for an ideal experience. 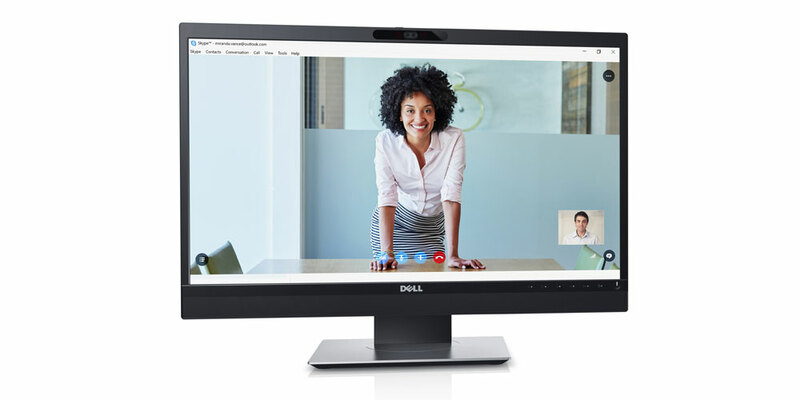 The Dell 24 Monitor for Video Conferencing improves collaboration with its built-in two megapixel Full HD IR camera with privacy shutter, noise-cancelling microphone and dual 5W speakers. It was purposefully designed to be Microsoft Skype for Business certified, including secure facial authentication via Windows Hello and hands-free commands via Microsoft Cortana. Additionally, our new consumer family of monitors is primed to thrill your senses. Coming in sizes ranging from 22-inch to 27-inch, the new family pairs compelling design aesthetics with expansive onscreen experiences. 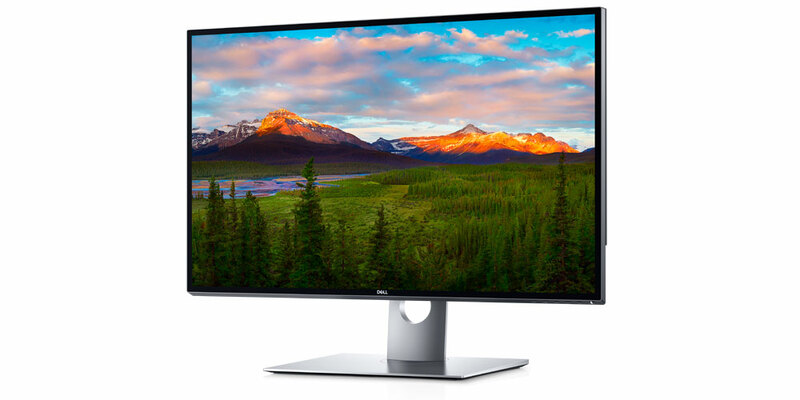 The Dell 24 and 27 Monitors (S2418HX/S2718HX) are the first consumer monitors to offer Dell’s InfinityEdge display for a virtually borderless experience, adding to the UltraSharp InfinityEdge lineup of monitors announced at CES 2016, plus Dell’s HDR feature1 to enhance the viewing experience. The Dell 24 and 27 InfinityEdge Monitors also feature dual 6W external speakers that provide premium, uncompromised sound, professionally tuned by award-winning Waves Maxx Audio. The Dell 22 and 23 Monitors (S2218H/S2318HX) let you see more with less distraction with three-sided ultrathin bezels and offer dual 3W built-in speakers. Last but certainly not least, productivity just got easier thanks to the Dell Premier Wireless Keyboard and Mouse combination that pairs elegant design and comfort with flexible wireless connectivity. With Dell Universal Pairing and Bluetooth LE, connect up to six compatible keyboards and mice using 2.4GHz wireless and easily switch between three devices such as a desktop, laptop, tablet or smartphone. Work anywhere with the track-on-glass laser mouse that performs on nearly any surface, including glass and high-gloss surfaces. Designed with premium materials, the KM717 fits into virtually any workspace and the sleek design provides comfortable usage for the course of the day. With a 12-month keyboard and six-month mouse battery life, the KM717 offers the type of day-to-day reliability that is synonymous with Dell. The Dell UltraSharp 32 Ultra HD 8K Monitor (UP3218K) will be available March 23 on Dell.com in the United States starting at $4,999. The Dell 27 Ultrathin Monitor (S2718D) will be available March 23 on Dell.com in the United States starting at $699.99. The Dell 24 Touch Monitor (P2418HT) will be available Jan. 12 on Dell.com in the United States starting at $399.99 and the Dell 24 Monitor for Video Conferencing (P2418HZ) will be available Jan. 12 on Dell.com in the United States starting at $329.99. The Dell 22 Monitor (S2218H) starts at $199.99, Dell 23 Monitor (S2318HX) starts at $219.99, Dell 24 InfinityEdge Monitor (S2418HX) starts at $289.99, and the Dell 27 InfinityEdge Monitor (S2718HX) starts at $379.99. All four S monitors will be available Feb. 23 on Dell.com in the United States. Dell Premier Wireless Keyboard and Mouse (KM717) are available on Dell.com starting at $99.99. 1 Dell HDR monitors require HDR10 enabled content from a compatible source like your service provider, a Blu-ray disc or a game. Dell’s HDR feature has been designed with a PC user in mind and supports specifications that are different from existing TV standards for HDR. Please review the specs carefully for further details.